Come 'Spend-A-Day' with us and meet our school family! 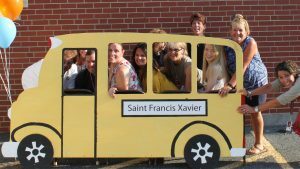 Thank you for considering St. Francis Xavier as a possible school for your child. We look forward to meeting you. Please take the time to peruse our website and learn about us through our various program offerings. We encourage you to come visit and take a tour. Please contact the school and we will set up a time for a student ambassador tour. We look forward to visiting with you to further discuss your interest in joining our school community. It is highly recommended for students entering Grades 1-8 that the family schedule a “Spend-A-Day” visit for their child(ren) prior to applying for admission. Please click here to Request More Information and we will get back to you as soon as possible. NEW families, ready to apply, please click here to begin our Online Application. We accept applications on a rolling basis. CURRENT families who are applying for a sibling please click here and log in using your ParentsWeb account. Submittal of the online application does not guarantee or confirm admission into the school. If entering Kindergarten, your child must also attend a Readiness Screening in the Spring (TBA). After submitting your online enrollment packet, you will need to send in the $120 per child (non-refundable) registration fee to secure your child’s slot. Medical Record (MA School Health Record which includes immunization record, medical history, and physicals provided by transferring school). Academic Record (sent directly from previous school once a release form has been signed and received by that school) including MA Transfer Card.